The trees are coming down, the scale seems a bit off, the families are back in their neck of the woods, and there’s finally something on TV other than A Christmas Story – that means December is in the books and it’s time to see what Mother Nature wrapped up and stuffed into our stockings for the month. 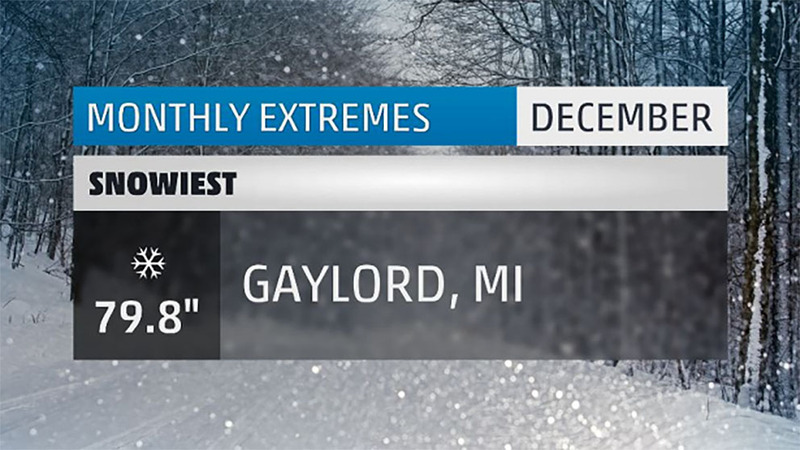 Here’s a look at December’s extremes! Winter may have officially started, but in the Southeast it felt more like an early Spring. Seven states had cities which posted a top ten warmest December on record – including Florida – where nearly every city cracked the top five. 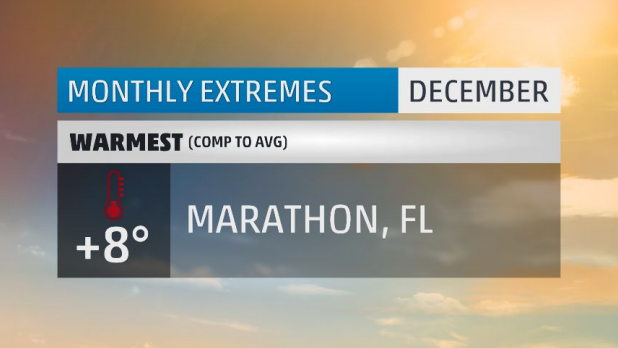 The warmest of these Floridian cities was Marathon, which landed its warmest December on record at 8 degrees above average. All 31 days of December had above average temperatures, including four separate 88 degree highs! If the daytime heat wasn’t bad enough, how about a balmy 81 degrees for a low temperature? That happened on the 18th as the difference between the afternoon high and overnight low was a measly 8 degrees. Eighteen daily high temperature records were set this month including Christmas Day at 83 degrees. Usually the fine folks of Marathon need to wait until April and May to see temperatures this warm. Meanwhile, cold was large and in charge across the northern tier of the US. Multiple shots of Arctic air, including a visit from the friendly-neighborhood-polar-vortex, kept folks from Washington state to Illinois on ice. Nine states dropped-in this month with cities that had a top ten coldest December on record. The coldest goes to the gorge town of Cut Bank, MT. Cut Bank, which is meteorologically famous for being one of the best spots to witness Chinook winds (intense wind storms that rush down the Rocky mountains and spike temperatures by as much as 60 degrees in the span of a few hours), is also home to long, cold, and brutal winters on average. 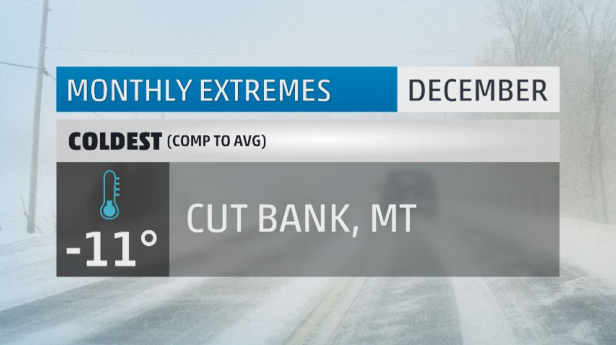 December was a roller coaster month temperature-wise for Cut Bank. The month started relatively mild before the first shot of Arctic air invaded the region. This was soon followed by yet another warm spell that lasted until the week of Christmas when yet another Arctic shot burrowed its way in. By the time Cut Bank-ians were counting down the waning seconds to 2017, temperatures had moderated back to average. But when it was cold this month, it was brutally cold. This included days where the mercury failed to read a positive temperature. Add blustery winds on top of this, and there were days with wind chills that dipped into the negative 50s! All in all, this was the 5th coldest December for Cut Bank at eleven degrees below average. How about a trip to paradise? Constant streams of tropical moisture kept surfboards and leis at bay and brought out the galoshes and umbrellas for those on the Big Island. Measurable rain fell in Hilo for 23 of the 31 days in December adding up to nearly two feet of rainfall. That put them at nearly nine inches above average for the month. For as much rain as they saw, it was only the 9th wettest December on record. 1954 holds the record with an astonishing 50.82 inches! 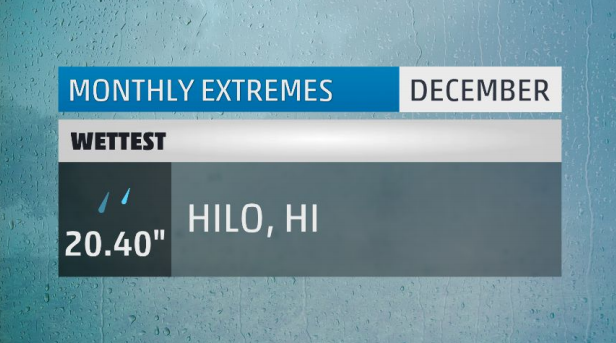 Even with this wet December, Hilo will finish on the dry side for the year at 28 inches below the annual average. Nearly an entire Shaquille O’Neal’s worth of snow fell at the Gaylord, MI National Weather Service office this past December. The office, which is located about nine miles south of the town of Gaylord, saw its snowiest month on record since opening in 1995. Only five days of the month were snow-free while six days ended with more than five inches falling. Gaylord was one of the lucky places to have a white Christmas this year, but they’re really no stranger to them as 16 of the past 18 Christmases have been white. The bulk of Michigan’s snow this month was due to persistent lake effect snow events. Averaged across the entire state, each reporting station contributed around 13 inches of snow making for a whopping 1300 inches all combined! Zero. Cloudy. Days. But for a place that sees, on average, 300 days of sunshine per year, that may not be much of a stretch. 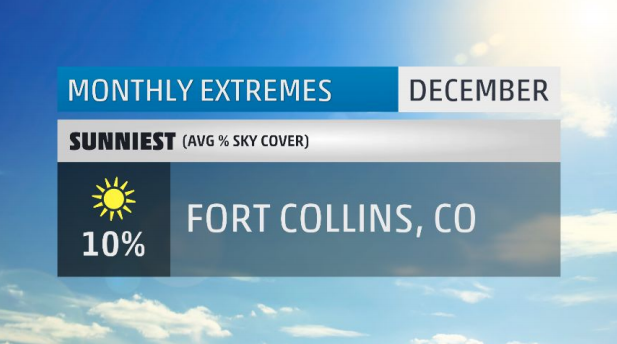 Fort Collins, Colorado was the sunglasses capital of the US in December with a paltry 10% sky cover on average per day. Eighteen of December’s 31 days were completely cloud-free, and 28 of them were categorized as mostly clear (less than 30% sky cover). We are right in the heart of the “sunny season” in Fort Collins which begins in August and ends in February. During this stretch, a typical day will feature no more than 10% sky cover on average. But even when the “not-so-sunny season” picks up in March, that number only goes up to 24%. On the flip side, those living in the upper-Midwest are no strangers to active weather. The Great Lakes region is a crosshair for storm tracks in all seasons. With so much active weather passing through, sunshine can sometimes be a scared commodity. 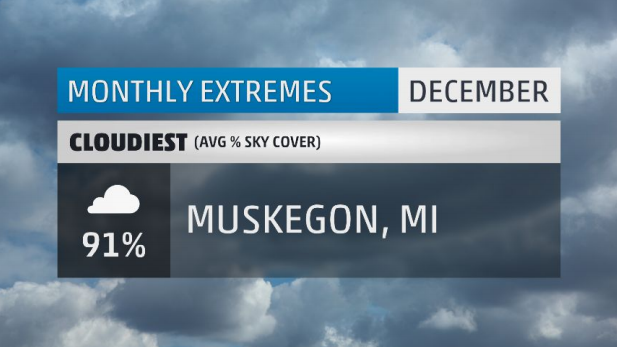 Take for example this month’s dreary champion: Muskegon, MI. Muskegon had just one day which could be considered mostly sunny (less than 50% sky cover), and only seven which were partly cloudy. The remaining 24 were, not just cloudy, but incredibly cloudy. Eighteen of those 24 days were completely overcast. Gray. Dismal. Dreary. December through mid-March is the cloudiest and most active weather period of those in-and-around the Great Lakes. During this stretch, nearly 50% of days are likely to be cloudy and feature some kind of precipitation. For Muskegon, only 75 days on average per year can be considered sunny. There you have it, the extremes for the month that was December 2016. See you next month for more!